Don't forget - There's still time to play along with our latest Inky Paws Challenge! 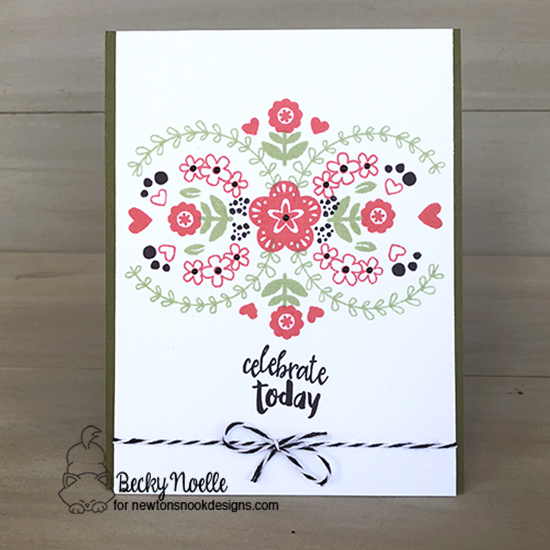 Becky Noelle combines three stamp sets to create this artistic delight. She stamps the leafy wreaths and sentiment from the Happy Little Thoughts stamp. Then she inks up images from the Cottage Garden stamp set. Then she selects the splattering of dots from the Tranquil Tides stamp set. Her ability to create this symmetrical design is superb! Debbie Owens cuts the frame using the Framework die set. 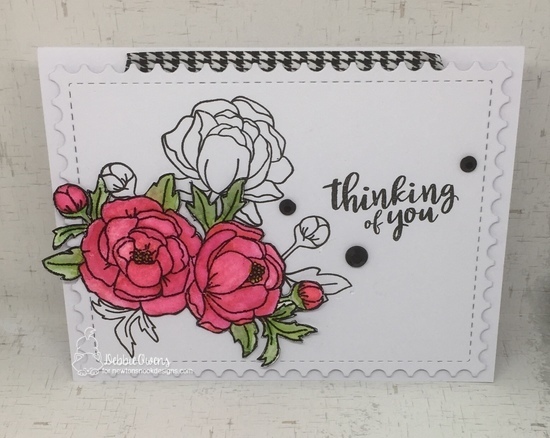 Then stamps a floral image and sentiment from the Peony Blooms stamp set. She then stamps and fussy cuts another floral image and colors it. She adheres to the frame using dimensional tape and adds enamel dots and washi tape to finish her card. 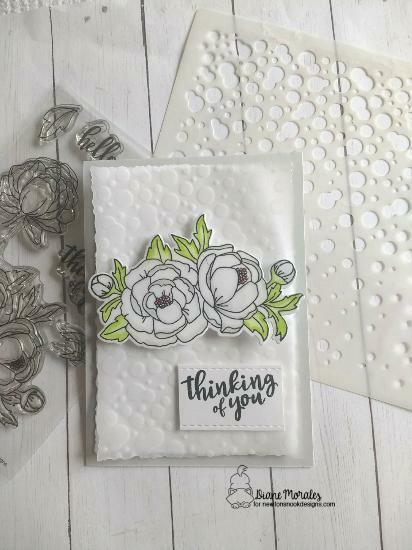 Diane Morales also showcases the Peony Blooms stamp and die set with this beautiful white on white card. She uses the Bubbly stencil to create the background. Then she softly colors the flowers and adheres with dimensional tape. The sentiment is then inked and added to complete this pretty card. 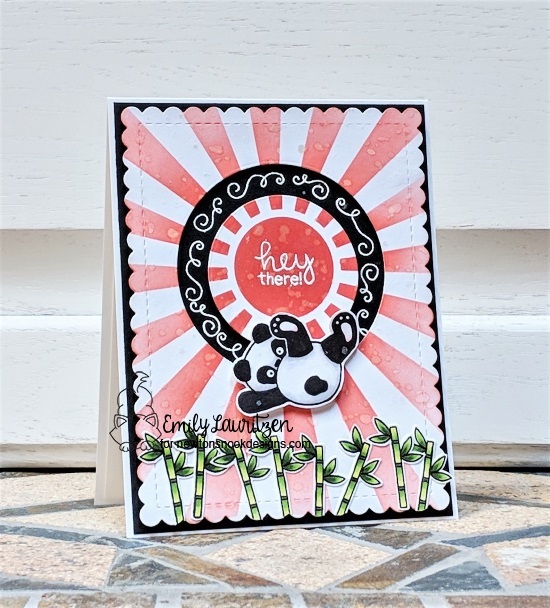 Emily Lauritzen brings us this playful card featuring the Playful Pandas stamp set. She creates the background by using the Sunscape stencil. She then creates a circular track allowing the panda to playfully spin around the card. Using the Playful Pandas dies, she colors and cuts the bamboo to add the bottom border. Sue T. creates this fabulous background using the Tropical Leaves stencil. She adds a sentiment from the Newton's Pot of Gold stamp set. Using the Frames & Flags die set, she creates the different layers for the backgrounds. 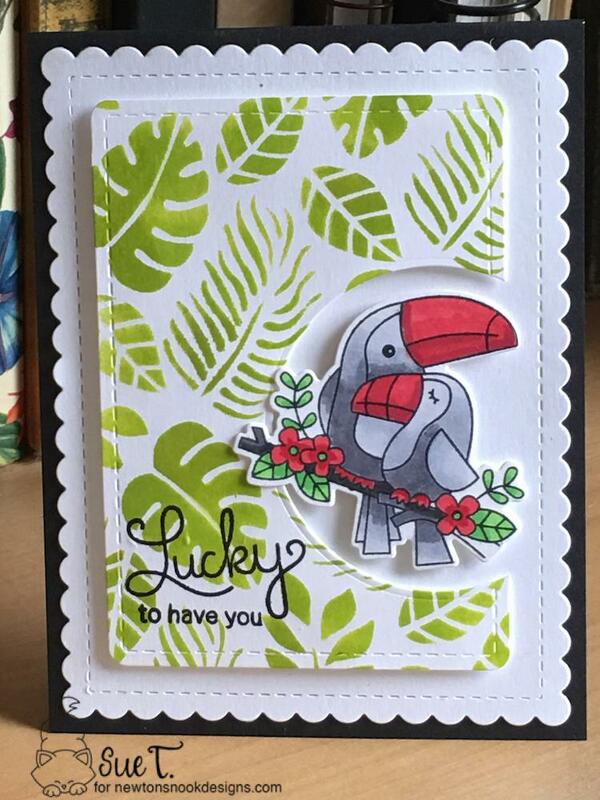 At last she colors and cuts the those sweet toucans from the Toucan Party stamp and die set. She adheres them in the circular cut out. What a fabulous card! I hope these projects have inspired you to play along! Remember, you have until this Friday, July 20, 2018 to enter. 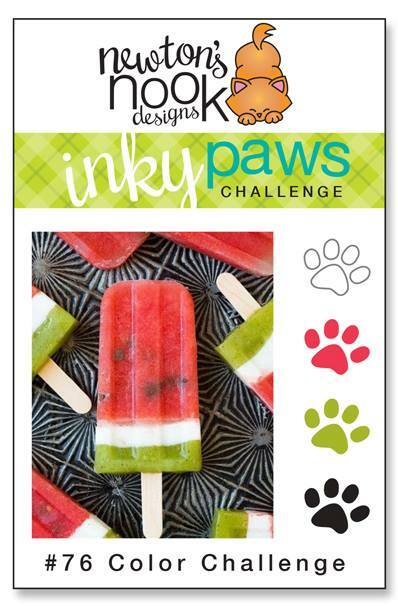 There's a prize involved too, so don't delay - view all the entries and see more inspiration on our Inky Paws Challenge here! Is there a way to get notified through email when a new challenge is up?